For over a century, families have trusted Genuine Thermos® Brand to provide durable, high-performing food and beverage containers. Thermos is here to protect what you love, which can take on many forms. It’s the foundation your day is built on, disguised as the simple joys of a morning routine. It’s the relief of knowing your child’s lunch will keep fresh until it’s time to enjoy. It’s the satisfaction in a job well done today that gets you one step closer to whatever you’re pursuing tomorrow. 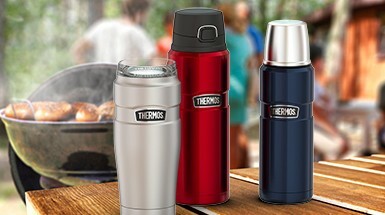 Thermos brand products that feature Thermos™ vacuum insulation technology are designed to lock-in temperature day-in and day-out. No matter what your day may bring, you can depend on Thermos brand insulated containers to keep food and beverages hotter, colder and fresher, longer. Thermos delivers when it matters most. Hot or cold, Thermos has it covered with its line of vacuum insulated beverage bottles. Constructed with durable stainless steel, these products are loaded with features and benefits that help withstand the demands of everyday use. Whether you’re hiking the trail, driving to work or reading a book, Thermos insulated beverage bottles lock in the temperature of your beverage for hours. Thermos water bottles are BPA-free and are great for staying hydrated at the gym or on the field. 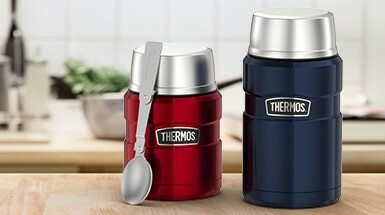 Thermos makes it easy to take the foods you love with you anywhere. Whether it's fresh cold fruit or piping hot soup, the Thermos line of stainless steel vacuum insulated food storage products keep air out and the delicious in. Easy to transport thanks to durable construction designed to withstand the demands of everyday use. Eating healthier never tasted so good! Thermos lunch bags and lunch coolers are perfect for packing a lunch for the office or taking soft drinks and snacks on the go. 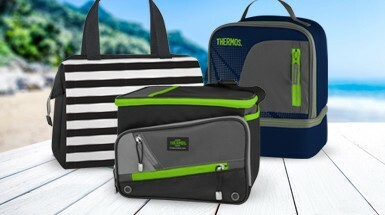 Featuring bright pops of color, Thermos lunch bags are PVC-free and lined with premium foam insulation to keep lunches cooler and fresher for longer. The durable exterior fabric is designed for easy care and the top zips closed to keep items secure. Thermos has defined, led and revolutionized the insulated container industry guided by a simple belief: When it comes to looking after the things that matter most, you shouldn't have to settle for good enough. 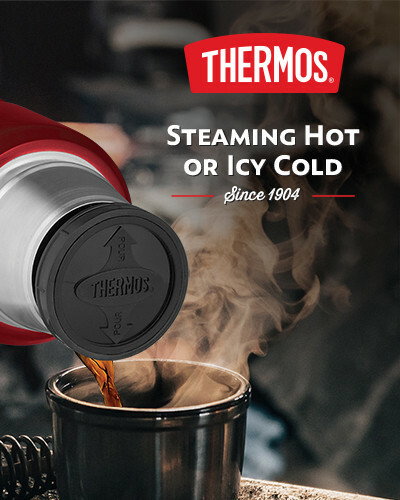 And with a company culture built on honesty, collaboration and ingenuity, Thermos looks forward to another century of providing families with products that are second to none. Whether you need an Insulated beverage bottle, food storage on the go or a cooler London Drugs has you covered.